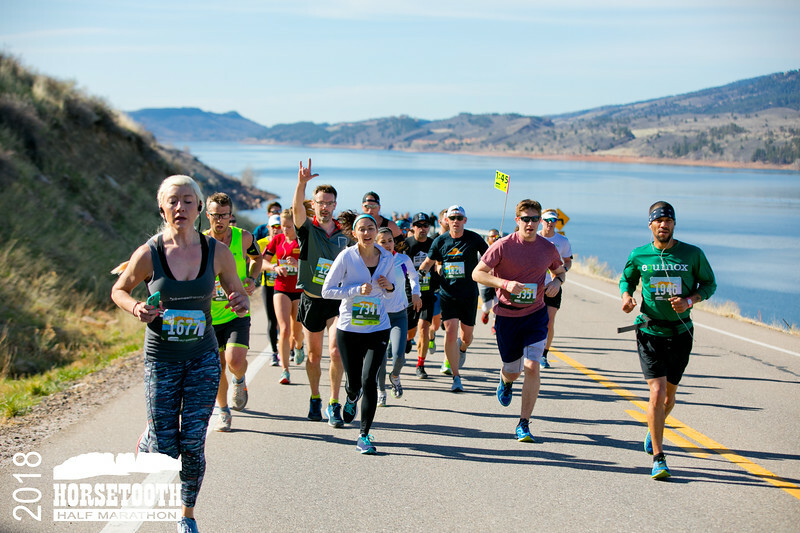 It was another record year for the 45th running of the Horsetooth Half Marathon, with over 1,750 runners from more than 40 different states crossing the finish line. In both the men’s and women’s races it was a close run thing with tight podiums, lead changes and drama all the way to the finish. In the men’s race, 2017 King of the Hill Tyler McCandless once again took it out hard from the gun, claiming the race premium for first man over the hill in a record 9:55 (5:40 pace). Eventual race winner Brandon Johnson (1:08:15) crossed the hill in sixth some 40 seconds back. Johnson would have to wait until mile 10 to claim the lead from last year’s champion and course record holder, Gebre Abadi (1:09:02), who would hold on for second place. 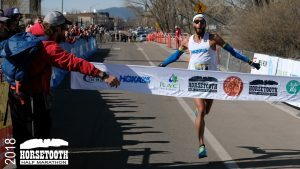 Colorado Springs-based, Tesfaalem Mehari (1:09:37) ran a controlled race to round out the podium in third, with Scott Dahlberg (1:09:51) and Alejandro Garcia (1:10:28) following in fourth and fifth for the final money spots. 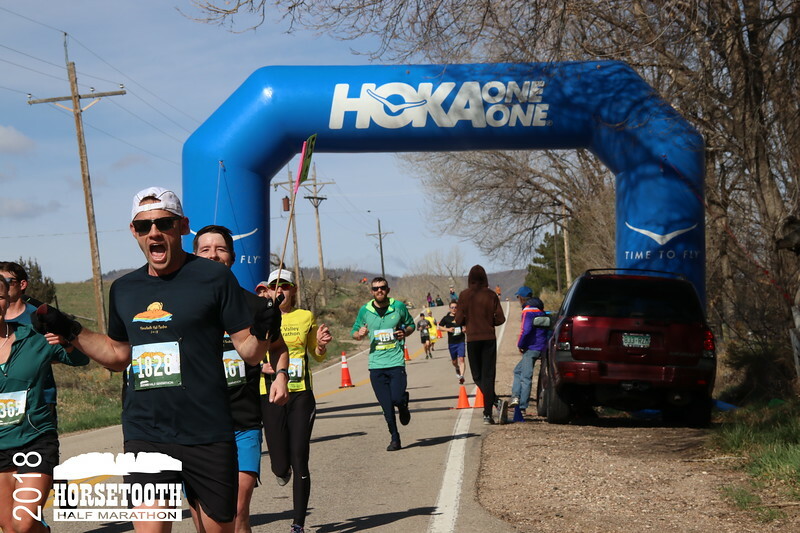 As in the men’s race, a new record was set for the Queen of the Hill with Boulder-based Kyle Blakeslee beating Sam Rivard to the top of Monster Mountain by some 18 seconds (11:49) and besting Brianne Nelson’s record from 2016. 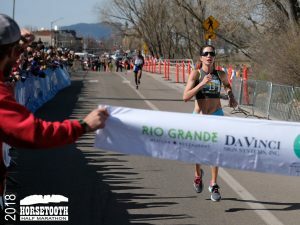 By mile 4, a sizable lead pack had formed with former winners Maggie Callahan and Nelson mixing it up with Blakeslee, Rivard, AnnMarie Kirkpatrick and Misiker Demessie. Once off the hills and onto the bike path at mile 9 it was local favorite Kirkpatrick and Ethiopian Demessie racing for the win with Rivard charging hard in third. Coming into the home stretch, Kirkpatrick was able to find the extra gear for the win in a time of 1:20:20 (second fastest ever), just 14 seconds ahead of Demessie in second and 30 seconds ahead of Rivard in third. Last year’s champ, Callahan would hold on for fourth (1:22:05) ahead of training partner Blakeslee in fifth (1:23:12). Taking home the prize money in the men’s master’s division was local favorite and previous winner Steve Folkerts (1:22:58), who beat last year’s masters champ Dan Clark by less than a minute. In the women’s division, Fort Collins’ Jenny Powelka (1:35:55) finished just over two minutes ahead of Vail’s Katie Crofton. Overall and age group award winners took home beautiful pottery awards from famed local potter Amy Hayman. 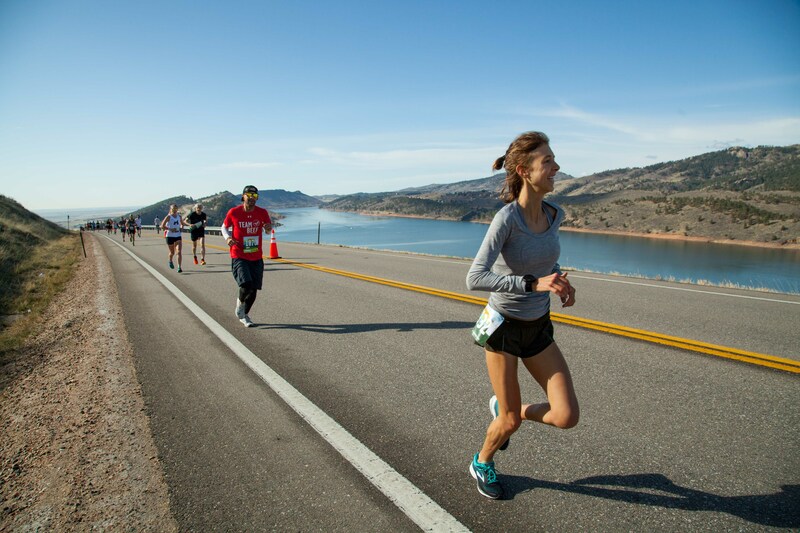 For those that weren’t able to collect their awards at the post-race prize giving, they are available for pickup for the next few weeks from Altitude Running, Fort Collins. And for those that did not get a commemorative pint glass at the finish, they are available for pickup at the New Belgium Brewing Tasting Room. The deep field and fast times were aided by the perfect running conditions we were blessed with this year. Race morning temperatures ranged from the low 40s into the mid 50s and gave way to beautiful post-race conditions which were perfect for hanging out and enjoying music from The Patti Fiasco at the New Belgium Finish Line Party. Some years you get lucky! Official race photos from our 5 race photographers are available here. In closing, we’d like to thank all of our wonderful volunteers that helped out in many different capacities to help make the 2018 running of the race a success. Thank You! We’d also like to thank our seven wonderful top-tier sponsors who have supported this year’s event with total enthusiasm. Please visit our sponsor page to see the full list of business sponsors and non-profit volunteer organizations who helped make this year’s race a success.